U. S. S. HELENA (CL50) DANFS HISTORY at the Naval History and Heritage Command website. (a) C.O. HELENA ltr. CL50/A16-3 of 31 July, 1943, (War Damage Report). 1. In many cases, the test of effective damage control is the saving of the ship following severe damage. In this case there was no possibility of keeping HELENA afloat inasmuch as she was struck by three torpedoes within a period of 3 minutes. Such severe damage was caused that she broke up and sank within about 20 minutes after the third hit. Nonetheless, it was fully demonstrated that her crew was exceptionally well trained and indoctrinated in damage control. Of the 1188 people aboard, less than 200 were lost despite the rapidity with which she broke up, the condition of complete closure existing, the fact that the crew was at General Quarters, and the loss of normal illumination. It is evident that thorough training resulted in a high degree of coordination of effort. 2. Another example of the attention paid to damage control will be found in reference (a), the Commanding Officer's War Damage Report. Promptly prepared under difficult circumstances, it is a report of outstanding excellence. For this reason, it is reproduced in complete form in Section III of this report. Reports of loss, as distinct from reports of damage in which the ship is not lost, are of great importance as insurance that whatever material lessons are involved will not be lost. It is realized that the preparation of a complete report of loss often may be an onerous task to the individuals involved, but it is only through such reports that the forces afloat can keep the Department fully aware of significant events and the need for material improvements. *The Commanding Officer's estimate was frame 89. The evidence, however, indicates a hit farther forward. This is discussed in Section IV. at about 0206. The combined effects of the second and third torpedoes resulted in the breaking of the hull in the vicinity of amidships. The hull slowly jack-knifed, hinging at about frame 82, and the whole ship sank slowly, middle part first. Quite slowly, the after part of the hulk assumed a vertical position, and the forward part a 45-degree angle. At about 0225, some 22 minutes after the first hit, the hulk, still in the same attitude, disappeared beneath the surface. The bow continued to float. 4. HELENA was the first U.S. cruiser - and the only one to date - to have been lost by breaking up after a torpedo attack. The case has been cited as an example of the potency of Japanese torpedoes, with the implication that they produce results far worse than normally would be expected. Despite the fact that the end result was unusual and unexpected, the sequence of events can be logically traced. Although the warheads which struck HELENA could have been any one of at least four types with charges varying from 660 pounds to as much as 1086 pounds of explosive, rapid breaking up would have been inevitable following hits located as these were, irrespective of size of charge in the above range. Analysis indicates quite definitely that no ship the size of HELENA or smaller could be expected to withstand the destructive effects of two torpedoes with even moderate-sized warheads hitting in practically the same spot. 5. Partly as the result of this case, SAVANNAH (CL42)* has had blisters installed. These will have the effect of increasing the beam and providing a greater margin of longitudinal strength in case of severe damage to the ship girder. It is problematical whether blisters would prevent breaking up where damage to the ship girder is as severe as that which occurred to HELENA, but unquestionably they will provide an increased margin which, in a borderline case, will be sufficient to prevent breaking in two under favorable weather conditions. 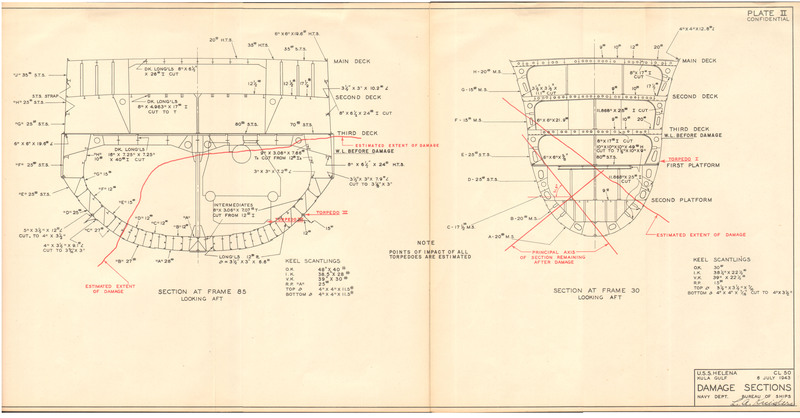 The decision to install blisters on SAVANNAH was based also on the necessity for obtaining the increased buoyancy and the improved stability characteristics necessary to permit replacement of the 5-inch/25 battery with the heavier 5-inch/38 battery. In addition, SAVANNAH had suffered extensive battle damage which necessitated an availability of several months for repairs. The long repair period permitted the installation of blisters. *Buships War Damage Report No. 44.
blisters can seldom, if ever, be justified solely as a measure to provide an increased margin against breaking up in the infrequent event of damage of the magnitude of that suffered by HELENA. 7. This case served to emphasize the value of the automatic relay-controlled hand lanterns. The Commanding Officer described the importance of the illumination which these lanterns furnished below-decks personnel as they made their way up to the main deck. As the result of the Commanding Officer's recommendation, the allowance of these lanterns has been doubled for all cruisers. 8. It is also apparent from reference (a) that an unusually high degree of training and indoctrination in damage control matters had been achieved on HELENA. For example, the fact that all personnel on the second platform between bulkheads 39 and 61 were able to escape is indicative of the emphasis which had been placed on even minor details of damage control procedure, such as the best routes of emergency escape from spaces occupied only at General Quarters. 9. The Commanding Officer's report of damage, reference (a), is reproduced in this section in lieu of a narrative prepared by the Bureau of Ships. Plate I was prepared by the Bureau and is based on the data contained in reference (a). In the course of the Bureau's analysis of the breaking up of HELENA, plates II and III were developed. Reference will be made to these in Section IV. Chief of the Bureau of Ships. USS HELENA (CL50) - War Damage Report. (a) Buships Serial 374 of April 17, 1942. 1. As directed by reference (a), the report of damage sustained by this vessel on 6 July, 1943, is forwarded herewith. It was not possible to obtain a large part of the information requested since the ship sank about 20 minutes after being hit by the first of three torpedoes. (a) Date damage received: 6 July, 1943; time 0203 to 0206 love. (b) Geographic position: Latitude 07-46 S, Longitude 157-11 E.
(c) Depth of water was well over 200 fathoms. (d) State of weather, fair; sea calm; sky partly overcast with no moon. (e) Estimated drafts before damage: 23 feet 8 inches forward, 24 feet aft, 23 feet 10 inches mean. (f) Course before damage: 292 degrees true, speed 25 knots. The signal for a simultaneous turn by the ships of the force had been ordered but had not been executed when HELENA was first hit. It was not possible to maneuver when the signal was executed. This ship in company with a task force of light cruisers and destroyers, attacked a force of Japanese light cruisers and destroyers skirting the north shore of Kolombangara Island enroute from Kula Gulf to their bases in the Northern Solomons. Our force comprised three light cruisers and four destroyers. When fire was opened, cruisers were in column, HELENA second ship. HELENA opened fire to port at 0157 Love, range 7050 yards. The first and second targets taken under fire had been sunk and HELENA had shifted to the third target when, at 0203 plus, she was struck by a torpedo near frame 32 port side. Though it was not apparent until personnel on the forecastle observed it while abandoning ship several minutes later, the bow of the ship forward of number two turret was sheared off by this hit. At approximately 0205, a second torpedo struck near frame 82 port, rendering inoperative the whole main propelling plant and causing loss of steering control. A third torpedo struck near frame 89 port at about 0206. All these torpedoes are believed to have been fired by the nearest destroyer in the enemy force. The cumulative effect of the second and third hits was the breaking of the ship in the middle. The forward and after parts (less the bow) slowly jack-knifed at about frame 82, and the whole ship commenced slowly to sink, mid-part first. The ship was abandoned. Gradually the after part of the hulk assumed a vertical position and the forward part a forty-five degree angle to it. About 0225, the sinking was accelerated, and the hulk, still in the same attitude, disappeared beneath the surface. The bow was still floating late the next afternoon. Ship listed 5 degrees to port after the second hit. After the third, she listed to starboard, reaching 30 degrees before sinking. Torpedo Hit No. 1 - Frame 32 port, about 15 feet below the water line. Torpedo Hit No. 2 - Frame 82 port, below armor belt, possibly 10 feet below water line. Torpedo Hit No. 3 - Frame 89 port, below armor belt, possibly 10 feet below water line. The line-up of machinery was that which was always used in battle. The forward plant consisted of main engines 1 and 4 in the forward engine room and the forward boilers, numbers 1, 2, 3 and 4. The after plant consisted of main engines 2 and 3 in the after engine room and the after boilers, numbers 5, 6, 7 and 8. Each plant had its own steam, feed, condensate and drain systems. All of these could be cross-connected by opening cut-outs at bulkhead 82, which separated the forward engine room from number 3 boiler room and which likewise separated the forward main propelling plant from the after main propelling plant. The electric plant consisted of four generators, numbers 1, 2, 3 and 4, each supplying an associated and correspondingly numbered distribution board. Numbers 1 and 4 generators were diesel driven. Numbers 2 and 3 generators were turbo-driven. During this engagement numbers 1 and 2 generators were running in parallel providing power for numbers 1 and 2 boards. Similarly, numbers 3 and 4 generators were running parallel supplying numbers 3 and 4 boards. A large flash was observed by those topside, accompanied by a large column of water which soaked personnel in the forward main battery director. Smoke and gaseous odors were observed at Repair One station (A-210-L) which however, did not impair anyone's efficiency. Since exhaust ventilation ducts in this compartment, which serve magazines known to have been destroyed, were shattered, the smoke and gases could have resulted from burning powder. However it is believed that the smoke and gases resulted from the torpedo explosion. They emitted through those ducts. Shock damage observed was limited to the area immediately adjacent to the hit with the exception that number 1 turbo generator suffered a casualty of unknown nature since there are no survivors from this station. At any rate, the watch at number 2 board informed the watch at number 1 board that number 1 generator had the full load for both boards, and this fact the power meter at number 1 board verified. It is possible that the overspeed trip of number 2 generator opened through shock, or that the generator circuit breaker jarred open through shock, or that violent fluctuations of the load, not noted at number 1 board, caused the governor of number 2 generator to lose control. In A-210-L, all ventilation blowers jumped completely out of their bases, at least one hitting the overhead. All loose gear such as jumper cables, damage control tools, was violently thrown about. Otherwise throughout the ship all remained intact. pressure remained up and the engines continued to generate power for 25 knots though the turns started to drop off due to the added resistance to headway. Both main gyros are believed to have been undamaged. The forward gyro was definitely observed to be functioning normally. The ship hogged and sagged considerably. Water poured from the air vent located in compartment B-204-L (repair 3 station) which served feed bottom B-954-W. This tank is on the port side between frames 87 and 91. It seems possible that the force of the first hit, coupled with the added resistance to headway resulting from the loss of the bow, caused the ship to buckle violently in the middle several times, her progress with the screws still turning being analogous in its motion to that of a caterpillar. The buckling of the ship could have caused the bottom plates under feed tank B-954-W to open, letting in sea water which filled the tank and overflowed through the vent pipe. In Central and in the After Engine room, no one was knocked off his feet. In B-302-L an officer reports being thrown to his knees. The Repair II Officer in C-201-1L also reports being knocked down. Various topside personnel also report similarly, indicating that the flexing was much more noticeable in the upper rather than in the lower portions of the ship. Forward of frame 61, all fuel oil tanks were full of either oil or salt water ballast except A-602-F and A-603-F which were empty, and A-606-F, which was a little more than half ballasted. Potable fresh water tanks were about two-thirds full. So far as is known, no actual hole was made by the explosion. The bow was completely blown off at frame 35, flush with Barbette #2. A section about 10 feet by 10 feet of the sheer strake on the port side was bent out 90 degrees at frame 35. In A-210-L, the entire deck in the vicinity of WTH 2-40 and the Repair One locker was raised some 6 inches, causing the ladder to WTH 2-40 to buckle and twist. In stateroom 210, port side of Barbette #2, the deck folded vertically, from forward to aft, blanking off the door to that room. Slightly aft, and on both sides of the barbette, the deck split on a fore-and-aft line, and buckled. A thwartship split about 6 feet in length appeared 1 foot forward of the coaming of WTH 2-40, with a hole about 12 inches in diameter on the port end of it. This hole and other small ones in the vicinity were apparently made by objects projected upward from below, as the edges were turned up and out. Bulkhead 35 was demolished. Others aft remained intact. and otherwise injured, yet escaped through the scuttle in WTH 2-40 while water was reaching a height within 2 feet of the overhead. On the first platform deck, A-415-L definitely remained intact. However, a man entering it from Barbette #3 noted water seeping down from WTH 3-40, so did not escape via that hatch as he had originally intended. Nothing is known of compartments forward of A-415-L.
On the second platform deck, all personnel escaped from A-520-M, A-525-M, and A-526-M and reported these compartments dry and intact. A-521-M and A-522-M were not manned. There are no survivors from magazines and the handling room forward of bulkhead 39. Only two or three men escaped from the shell deck of Barbette #2 and none from below the shell deck. The shell deck flooded rapidly. Presumably this water receded as it did in A-210-L after the ship had lost all headway, but no one returned later to inspect it as did the Repair One Officer and the Carpenter in A-210-L.
No fires resulted from the hit. So far as is known, no magazine explosions occurred either, though it is difficult to believe that one torpedo could do so much damage, or could hit in a magazine, as is believed to be the case, where powder was being handled, without causing some to explode. No damage control measures were taken. Subsequent hits followed so closely that repair parties had time only to report the hit. This hit, had it been the only one received in the action, would have seriously jeopardized any chance of getting the ship out of enemy waters. It struck in the one position where it is possible, in a single stroke, to render inoperative all of the main propelling machinery. That is, it caused serious damage in both plants by striking close to bulkhead 82. (1) Steam pressure dropped rapidly. (2) Water rose in the glasses of boilers 1, 2, 3 and 4, then dropped rapidly out of sight. The emergency feed pump was started, but due to failing steam pressure, the water level in the boilers could not be restored. (3) As steam pressure continued to drop all other auxiliary machinery failed. (4) All regular lighting failed. Relay operated emergency lanterns switched on. (5) All communications with other stations were lost. There is no eye-witness account of what happened here. Personnel in the. electric work shop directly over the port side of this space state that immediately after this hit a loud noise was heard below, as though some piece of machinery were running away, then all was silent. (1) The port side of bulkhead 85-1/2, in way of number 6 boiler, ruptured. (2) There was a momentary flash of flame within the operating station. (3) Water poured into the operating station through the ruptured bulkhead. (4) Four men escaped from the operating station by way of the starboard access trunk. They were the two burnermen of number 7 boiler, the messenger who was standing just aft of the emergency feed pump, and the saturated side burnerman of number 8 boiler. (5) Water entered the station so rapidly that these four were literally floated up the trunk. Air was compressed in the top of the trunk below the armored hatch, and temporarily halted the rise of water until the hatch was opened by the evacuees. The water reached the third deck as soon as they did. They left the trunk by the watertight door to the third deck. It is believed that one of them closed this door. (6) Of the four evacuees, one was severely burned and later died. (1) The steam, feed, and fuel oil pressure gauges of both plants dropped rapidly. (2) Communication with all stations was lost. (3) All regular lighting failed. The relay-operated emergency lanterns switched on. (4) All machinery came to a stop for lack of steam. (5) The ship took a five degree list to port according to the inclinometer. From the above information, it is believed that the torpedo struck the ship just aft of frame 82 on the port side below the armor belt. Bulkhead 82 must have ruptured, flooding the forward engine room rapidly. Bulkhead 85-1/2 was seen to be ruptured. It is believed that number 4 shaft was broken. This would have caused number 4 main engine to speed up momentarily, the load having been taken from it, and would have accounted for the noise heard by the personnel in the electric work shop just overhead. (At Pearl Harbor on 7 December, 1941, number 1 shaft was parted at the coupling where it joins the reduction gear. *) Quite possibly the auxiliary steam line on the port side of the forward engine room near bulkhead 82 was ruptured. In addition a heavy leak might have been started at a main steam line joint in the forward engine room. Without a doubt, the rapid loss of pressure in the forward plant was caused by loss of steam through broken or leaking piping in the forward engine room, or both. It is likewise certain that the loss of steam pressure in the after plant was due to the rupturing of steam piping in number 3 boiler room. Number 6 boiler must have been demolished, and the main and auxiliary steam piping leading to it broken. Number 3 boiler room and number 2 boiler operating station flooded immediately. * Buships War Damage Report No. 4 - HELENA. available). The Commandant, Navy Yard, Mare Island, and the Commander Service Force, Pacific Fleet, placed endorsements on this letter. It was referred by the Vice Chief of Naval Operations to the Bureau of Ships for comment. Consequently, it is estimated on the basis of similar experience at Pearl Harbor on December 7, 1941, that within two hours number 4 boiler room would have flooded completely from number 2 boiler operating station even if no other damage had occurred. (a) Numbers 1, 2, 3 and 4 boilers and their auxiliaries, located in numbers 1 and 2 boiler rooms and in number 1 boiler operating station. These ordinarily provided the steam for the forward plant. (b) Numbers 2 and 3 main engines and their auxiliaries, located in the after engine room. Steam for these engines ordinarily came from boilers 5, 6, 7 and 8 of the after plant, now out of commission. (a) Breaks in the main steam line, particularly in vicinity of number 6 boiler, which were in flooded compartments and could not be isolated. Though the main steam stop of number 6 boiler is connected by reach-rods to a third deck remote control, it is highly probable that the reach-rods were so distorted as to make operation impossible. (b) The main steam line cross-connecting valves were located in the forward engine room at bulkhead 82 under water and could not be opened locally. It is probable that they could not have been opened from the third deck remote controls because of distorted reach-rods. 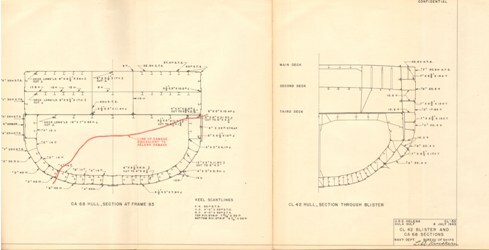 (c) The cross-connecting cut-outs of the auxiliary steam line were located under water in the forward engine room and number three boiler room. Hence they were inaccessible, and since they were not fitted with remote controls, they could not be opened by any means. (a) Load on number 1 board rose rapidly, then bus tie circuit breaker to number 2 board opened. This was probably caused by short circuits in electrical equipment in the forward engine room served by number 2 board and then by the flooding of number 2 board itself. (b) Next, number 1 generator circuit breaker opened. Apparently no AQB switches on number 1 board opened. None of the AQB switches were locked closed. The cause for the opening of the generator circuit breaker is not known. (c) There is no direct information as to what occurred at number 2 board. (d) At number 3 board the bus tie circuit breaker to number 4 board opened, apparently due to shock. It is further believed that the overspeed trip of number 3 generator operated due to shock, but this is not sure. If for no other reason, the generator ceased functioning for lack of supply from the auxiliary steam line. No attempt was made prior to the next hit to energize the board by closing the bus tie circuit breaker to number 4 board. (e) The operation of number 4 generator and number 4 board remained normal. The second hit completely decommissioned the main propulsion machinery. The third hit insured the failure of the hull, which was well started by the second hit. The assumed location of the third hit, frame 89 port, is based principally upon the observation of the personnel still in the after engine room when that hit occurred. The Engineer Officer had ordered this space evacuated after the second hit when it was apparent that the main engines were useless and there was no communication with other stations. He and about five others remained to make a final check, and these personnel were on the upper grating near the forward bulkhead where the engine controls are located. When the third torpedo struck (about 1 minute after the second) men who had been ordered to evacuate the space were still going up the trunk and out of the armored door to the third deck. At this moment the people still on the upper grating in the engine room were sprayed with water and oil which came from an unknown source. The forward bulkhead of the after engine room (number 92-1/2) had apparently ruptured in the vicinity of the lower strakes. Water could be heard pouring into the bilges in large quantities. The abandonment of this space was completed. stations aft of bulkhead 103 to support such assumption. It was not located in the after engine room (between frames 92-1/2 and 103) because the personnel still in that space would have been killed. Since the forward bulkhead of the after engine room (bulkhead 92-1/2) was ruptured, the hit could have been only a few frames forward of bulkhead 92-1/2, hence frame 89 port has been assumed as the location of the third hit. The third hit took place so near to the second hit that the effects of the two overlapped thereby reducing the number of effective fore and aft stiffening members in the mid part of the ship. Therefore she sagged and broke. This was vividly observed by personnel in compartment B-306-L and in compartment B-204-L. Almost immediately after the third hit the ship sagged so deeply that the men in these compartments saw water pour in upon them from the port side, either through the buckled side plating or up through deck seams, or both. Compartment B-306-L flooded so rapidly that personnel barely escaped before the compartment was completely filled. Five minutes after the hit the Engineer Officer noted a large ventilation trunk in the compartment just aft of B-204- L. This trunk served the after engine room. Water was squirting with some force from a flanged joint about 3 feet below the overhead, which in this case was the main deck, and it appeared that, were it not for the armored third deck and the side armor, the ship would have broken in half and sunk much more rapidly. At the time of third hit only two principal pieces of engineering machinery were still operating, numbers 1 and 4 generators, which are diesel driven. Both of them stopped for reasons not known, but severe vibration causing any one of several casualties such as broken fuel lines might have been the reason. Number 1 was rolled over by compressed air in an effort to restart and seemed to turn normally. It could not be made to fire, however. (a) Provide added stiffness for the mid part of the ship. HELENA hogged and sagged violently after the first hit and there is some evidence pointing to the fact that she was severely strained amidships at this time. Only the side armor and the third deck held her together after the third hit for the period of time before she finally sank. (b) Separate the forward and after main propelling plants by a compartment or compartments instead of just a bulkhead. Such units as evaporators and diesel generators might be installed in the space between. The chance of knocking out both main propelling plants with one blow would thus be greatly reduced. If cross-connections between the two plants are to be installed, then make it possible to operate all of them from the third deck. Finally, a word should be said for the inestimable value of the Type JR-1 relay operated battle lanterns, which were the only source of illumination after the ship's lighting system failed. The confidence that these beams of light along the exit routes maintained in the men contributed largely to the lack of panic and contributed to the saving of many lives. There were 110 of these lanterns installed throughout the ship in locations best suited for just such an emergency. This is twice the number shown in the ship's machinery allowance book. The excess was obtained through an error, but in view of this experience it is believed that the quantity of 110 is the acceptable minimum for cruisers. It is recommended that the allowance of this item for cruisers be increased accordingly and that it be increased proportionately for other types of ships. 10. In recent months, additional information concerning the size and type of Japanese torpedoes employed by surface forces has become available via the Office of Naval Intelligence. In addition, some intact Japanese torpedoes have been recovered and these have been examined and tested under the direction of the Bureau of Ordnance. 11. Present information indicates that Japanese surface ships of the destroyer and cruiser types may employ any one of four types. The oldest of these is a 24-inch diameter torpedo, frequently referred to as the "8th-year" type, with a warhead estimated by the Bureau of Ordnance to contain between 800 and 860 pounds of explosive*. It is believed that the development of this, the first of the so-called Japanese "giant" torpedoes, began in 1919. It is possible that it is still in service on the older destroyers and light cruisers. * Initially "Shimose" - 100% picric acid. Later torpedoes may have "Type 97" explosive. ** Tests by the Bureau of Ordnance of recovered Japanese warheads reveal that this is about equivalent in explosive power to TNT. installed on PT boats and on some of the older destroyers. 13. In the early 30's, the "Type 90" torpedo was developed. It was the second in the series of giant torpedoes having diameters of 24 inches. The warhead is estimated to contain about 880 pounds of explosive. The first explosive used in this torpedo was "Shimose," but the warhead has now been modified to carry "Type 94"* explosive. The production of this torpedo was well along by 1938, and at that time installation was started on Japanese cruisers and destroyers, replacing the "8th-year" type to a considerable extent. 14. The most recent development of the giant torpedoes is the "Type 93". This 24-inch torpedo contains 1086 pounds of "Type 97" explosive. One of these was recovered from a sunken destroyer in September, 1943. Naval Intelligence reports indicate that its development was complete about 1938, and its installation in modern destroyers and cruisers started about 1940. New construction since 1940 is presumed to utilize this torpedo. Other information indicates that it was first used in action during the sea battles in and around Java, in February, 1942. 15. In May of 1942, a Japanese destroyer was sunk at Tulagi, and this destroyer has since been raised and found to have 24-inch torpedo tubes. A sister ship of this destroyer was sunk in the night action in which HELENA was lost. It thus appears that some of the Japanese destroyers in this action may have been equipped with 24-inch torpedoes of either the "Type 90" or "Type 93" classes. This, however, does not indicate that only these two types were used by the Japanese in this action and it may be that the "Type 89" and the "8th-year" types also were employed. 16. The above indicates that HELENA could have been hit by any one of the four types described. As will be discussed below, however, analysis indicates that variations in charge weight above 660 pounds probably would not have had any significant effect on the end result. Thus, the 660-pound charge could have caused the loss of HELENA almost as readily as the 1086-pound charge. * Intelligence information indicates that this may be 40% RDX and 60% TNT. There have been no reports of the recovery of warheads or other weapons containing this mixture. and the paragraphs mentioned will be as numbered by him. 18. In paragraph 2, Section III, the Commanding Officer estimated that the first hit occurred about 15 feet below the water line. In paragraph 3, however, in describing the effects of this hit, the statement is made, "on the first platform deck, A-415-L definitely remained intact", and again, that on the second platform, "all personnel escaped from A-520-M, A-525-M, and A-526-M and reported these compartments dry and intact". It thus seems beyond doubt that bulkhead 39 remained intact below the third deck. Paragraph 3 states that between the third and second decks "bulkhead 39 was ruptured, yet was not completely demolished". These statements indicate that the center of maximum structural damage was in the vicinity of the third deck level. A large flash was observed by topside personnel (see the beginning of paragraph 3, Section III). Therefore, all the evidence indicates an extremely shallow hit, quite certainly above the 2-inch first platform deck, which was only about 5 feet below the water line. 19. Based on the results of the shallow torpedo hits on PORTLAND* and PENSACOLA*, the section at frame 30 in way of the damage, shown on plate II, was prepared. It will be noted that between turrets I and II the hull narrows considerably. For example, at the first platform level at frame 32, the beam is approximately 31 feet. In this vicinity most of the resistance of the ship girder to bending is provided by the upper part of the structure, i.e., the sheer and stringer strakes. If the upper portion (the sheer and stringer strakes) of the ship girder is destroyed and if the major portion of the port shell is missing, the bow structure forward of the damage becomes free to swing about the remaining intact starboard shell plating. If the torpedo detonated above the first platform, damage of the order described above and shown on plate II occurred. Analysis of the bending moments at the damaged section clearly indicates that the remaining members in the lower portion of the starboard shell would be insufficient to prevent failure. Further, if a fracture were started, the magnitude of the forces involved would insure complete failure in a very short time. It is emphasized that the damage shown on plate II is consistent with what can be expected from a 660-pound charge detonating in the vicinity of frame 32 at shallow depth and somewhat above the armored first platform. * Buships War Damage Report No. 35. It will be recalled that in the case of PORTLAND, it was concluded that a 660-pound warhead caused the damage. have been ruptured. In this event complete failure of the ship girder would have been unlikely. 21. In paragraph 3, Section III, the Commanding Officer attributes the beginning of the structural break-up amidships to a whipping action induced by hit No. 1. This may have been a factor, but the structural failure is accountable even without this. The Commanding Officer's report definitely establishes that there were two hits amidships. In paragraph 2 of Section III, it was estimated that the two hits were located about 10 feet below the water line. It appears, however, that both of these hits were deeper than 10 feet. In paragraph 4(b), it is noted that all personnel in the electrical shop on the third deck between frames 71-1/2 and 77, starboard, escaped. Again, in paragraph 4(c)(5), it was reported that four men escaped from the after boiler operating station via the starboard access trunk and the third deck. Further, all personnel escaped from B-306-L, an athwartship compartment extending completely across the ship between frames 77 and 82 on the third deck. It is, therefore, quite definitely established that the third deck was not badly damaged or these people could not have escaped. Those men who left B-306-L reported water flooding rapidly, an indication that port shell or third deck seams possibly were open. The absence of casualties to personnel on the third deck is a clear indication that the deck was not blown up or otherwise badly damaged. If the third deck were not damaged to any great extent, other war experience, notably that of MINNEAPOLIS* and CHESTER*, indicates that the torpedoes must have been considerably deeper than 10 feet - possibly as much as 15 feet below the water line. 22. The Commanding Officer estimated that hit No. 2 was located at frame 82, port, and hit No. 3 at frame 89, port. From a description of the damage, the location of hit No. 2 is reasonable. The events which occurred in the after engine room (see paragraph 5, Section III) indicate that hit No. 3 was located at about frame 85 rather than at frame 89. This follows from the fact that personnel in the after engine room escaped after the third hit. Bulkhead 93 undoubtedly was damaged - but only to an extent which caused rapid flooding rather than instantaneous flooding. Had instantaneous flooding occurred, it is doubtful that any personnel would have survived. Rupture of the bulkhead, rather than destruction, places the hit farther forward than frame 89, only 16 feet from bulkhead 93. A detonation at frame 85, 32 feet from bulkhead 93, is more consistent with the reported rate of flooding. In any event, it is clear that the two torpedoes were located so close together that the third entered the hole caused by the second. Possibly the third torpedo detonated against the debris of No. 6 boiler. As the result of the penetration of the third torpedo, prior to detonation, the bottom flange of the ship girder was destroyed almost completely across. In addition (as will be seen on plate I), three large compartments (counting the two after boiler rooms and the boiler operating station as one compartment) were flooded - a total length of 124 feet. Thus, the results of these two torpedoes striking so close together were first, to demolish a very substantial portion of the bottom flange of the ship girder and second, to impose a large sagging bending moment on the severely weakened structure. 23. In analyzing the breaking up of HELENA, the damaged section in way of frame 85, shown on plate II, was developed. The damage to the ship girder shown on this section is based on the Commanding Officer's description as modified by the remarks in paragraphs 21 and 22 above, and also on the damage from a single torpedo hit on MINNEAPOLIS*. The results of this analysis indicate that for the damage shown on plate II and assuming the bending moment occurring in still water, the induced tensile stress in the remaining bottom structure was some 33% above the yield point of the material. Specifically, this stress was calculated to be 16.4 tons per square inch, considerably higher than the yield point of the material involved (13.4 tons per square inch) and almost twice the designed stress of 9.1 tons per square inch tension in the keel. This induced tensile stress in the most strained fiber is of such magnitude as to cause breaking up at a comparatively slow rate, particularly when the assistance given by the side armor and armored third deck is considered. This is consistent with the period of about 20 minutes which was required for HELENA to jack-knife in the middle and sink. It thus appears that the damage assumed and shown on plate II is reasonably consistent with that which caused HELENA to break in two. * Buships War Damage Report No. 36. It will be recalled that damage to MINNEAPOLIS was concluded to have been caused by a 660-pound warhead striking about 15 feet below the water line. broken in two under favorable weather conditions. 25. In general, a given charge will produce a given amount of damage. The end effect on a target with respect to damage to the ship girder thus becomes a function of physical dimensions -beam, depth of girder, length and displacement - as well as the scantlings of the longitudinal strength members. The beneficial effect of the blisters would thus be partly due to the increase of beam from 62 to 70 feet (which removed the detonations farther from the starboard members, thus insuring that more structure remained undamaged) as well as to the increase in sectional modulus. In following this line of reasoning, an analysis was made of the strength of the CA68 hull after damage of the same order as that assumed for HELENA. The damaged section is shown on plate III. The beam of the CA68 hull is 70 feet and this ship, being somewhat larger than HELENA, has correspondingly heavier scantlings. 26. Because of somewhat better subdivision on CA68 (the engineering spaces are not as long) the total length of flooding would only have been 100 feet as compared to 124 feet on HELENA and the sagging bending moment, therefore, would have been somewhat less. The tensile stress in the structure remaining on the starboard side was found to be only 9.3 tons per square inch, considerably less than the 16.4 tons per square inch for HELENA'S hull and the 12.4 tons per square inch for HELENA'S hull with blisters. The figure of 9.3 tons per square inch is also considerably less than the yield point of 12.4 tons per square inch of the hull material. It thus appears that CA68 would have survived the damage assumed for HELENA, in calm water, and assuming that cracks did not progress through otherwise undamaged structure. 27. It is obvious that HELENA would have survived the loss of the bow forward of No. II turret as did NEW ORLEANS*. The effects of the two hits amidships were combined in about the worst possible manner from the standpoint of maximum damage to the ship girder. In designs based on limited displacement, as was the case for HELENA and her sister vessels, it is impracticable to consider measures for absorbing such extensive destruction of the hull. Cruisers designed since weight limitations were removed have hulls as large or larger than the CA68 class and are thus better able to absorb such damage as caused HELENA'S loss. 28. The blisters shown on plate III have been installed on SAVANNAH (CL42). In addition to the desirability of providing an increased margin of structural strength after damage to the ship girder, blisters were required to provide the increased buoyancy and the improvement in stability characteristics necessary to permit the replacement of the 5-inch/25 battery with the heavier 5-inch/38 battery. The long period of availability for extensive battle damage repairs permitted the installation of blisters and the replacement of the battery. *Buships War Damage Report No. 38. 29. The installation of blisters is an alteration of considerable magnitude - involving months out of service and the utilization of considerable manpower and material. A comparatively large number of new cruisers have joined the fleet in the last year and others will go into service in the immediate future. Shipbuilding and ship repair facilities will be strained to the utmost to provide the necessary manpower and materials to maintain existing ships and to construct new vessels. In view of these considerations, the Department has decided that the installation of blisters on the seven remaining ships of the class is not justified, except in cases where there is a long period of availability for repair of battle damage. 30. Unfortunately, the second torpedo struck at the juncture (bulkhead 82) of the two machinery plants, putting both out of operation with the exception of the two ship's service diesel generators. This is the one location where a single torpedo hit will put both plants out of operation. 31. 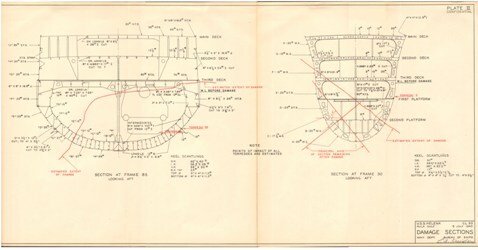 In paragraph 6(b) of Section III, the Commanding Officer suggested that the two machinery plants be separated by a compartment instead of by only a bulkhead. Such an arrangement is obviously desirable in machinery plant layouts similar to that of HELENA. To be sufficiently effective, however, such a compartment would have to have a minimum length of about 25 feet. This separation of the forward engine room from No. 3 boiler room is required to provide a reasonable chance that a torpedo hit in way of either space would not damage the other. This amount of space and its corollary increase in weights* have not been available in cruisers with HELENA'S machinery arrangement. Certain other disadvantages of machinery arrangement, length of propeller shafting and arrangement of uptakes are also involved. However, ships of the CA139 class, a much larger type than HELENA, will have four machinery rooms in line, with the second and third separated by an auxiliary machinery space 24 feet in length. Each main machinery space will contain a complete plant with boilers, turbines and necessary auxiliaries. This arrangement, therefore, is substantially equivalent to that suggested by HELENA'S Commanding Officer. * On HELENA, for example, an 8-foot increment of length in way of the machinery spaces involves an increase in hull weight of about 110 tons. ** Buships War Damage Report No. 4.
specified to be of watertight construction even with the boilers in operation. They were admittedly difficult to maintain in a watertight condition. The boiler operating stations were initially provided HELENA and ST. LOUIS (CL49) - the only two cruisers to be so equipped - for protection from heat for the boiler operating personnel. 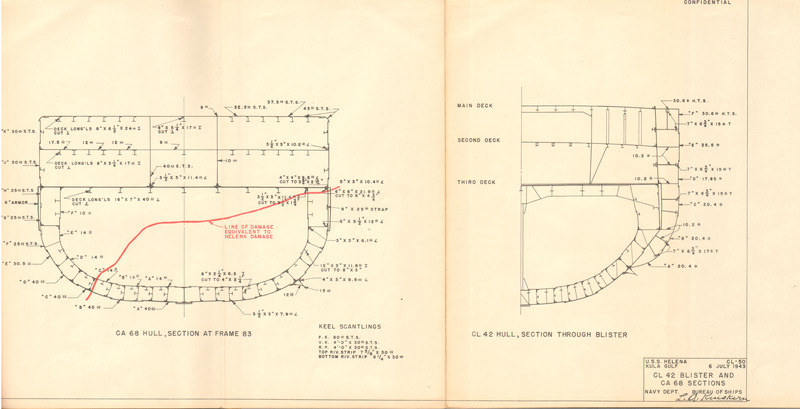 At the time these vessels were designed (1936), open firerooms had not been adopted in cruiser designs. The boiler operating station, at this stage of the development of boilers, was an intermediate step in the transition from the closed fireroom to the open fireroom which came later. 33. In the face of the damage HELENA received, there was little which the Damage Control and Engineering Organizations could do to control the situation. Nonetheless, it is evident that the crew was thoroughly indoctrinated in damage control. In paragraph 3 of Section III, it will be noted that all personnel in the magazines on the second platform aft of bulkhead 39 were successfully evacuated - necessarily in a very short time. The Repair I party, located in A-210-L on the second deck, was largely responsible for this. They successfully coached the magazine crews and other personnel on the second platform up through turret III to the main deck. 36. In closing his report, the Commanding Officer commented on the "inestimable value" of the Type JR-1 automatic relay-controlled battle lanterns. These lanterns were developed for just such a purpose as that fulfilled on HELENA. The early type, such as those installed on HELENA, required a moderate amount of maintenance to prevent the base plug connection (of the split-prong type) in the lantern from dropping out under shock. This matter has been publicized many times by circular letters and bulletins of information which recommended routine checks and adjustments as necessary. In case of HELENA, obviously the necessary maintenance measures had been taken. A new type of plug with a bayonet joint is now in production and will be issued to the fleet as soon as available. As the result of HELENA'S experience and the recommendations of the Commanding Officer, cruiser allowances of the Type JR-1 lanterns have been doubled, and the allowances for other types of ships greatly increased. 37. HELENA was a distinguished ship. Her offensive exploits already have become legendary. In the record of her loss, it is evident that her offensive effectiveness was based solidly on well trained and highly coordinated engineering and damage control organizations.